With the 3D printing industry projected to have a CAGR (Compound Annual Growth Rate) between 25-30% for the next 5-7 years, well-known 3D printer manufacturers such as 3D Systems (DDD), Stratasys (SSYS), XONE (XONE), and voxeljet AG (VJET) reached extraordinarily high valuations in 2013. Many expressed their belief that the valuations of these stocks had gone beyond the fundamentals required to support their share prices. Year-to-date, Stratasys (SSYS) has dropped 17.4%, 3D Systems (DDD) is down 32.0% ExOne (XONE) down 36.5% and Voxeljet is down 26.4% due to valuations not supported by fundamentals. That said, there is a stock that provides exceptional value for investors who want exposure to the 3D printing industry’s forward growth that they may wish to consider, and that stock is the subject of this article. The 3D printing industry as defined by Wohlers Associates consists of “all products and services” worldwide, yet many have been investing in only the “products” side of the industry…the “3D printer stocks”, while ignoring the services side of the industry. I believe this played a role in the overvaluation of well-known 3D printer stocks mentioned above. Many industry analysts predict 3D printing services will account for the majority of growth in the 3D printing industry for the next 5-7 years, not the sale of consumer and industrial grade printers. 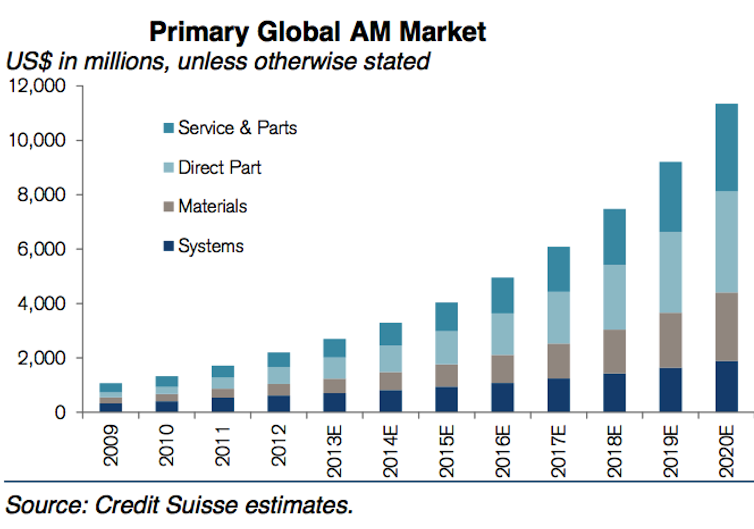 Many investors focused on the systems/3D printer stocks may be surprised by the following global Additive Manufacturing market estimates by Credit Suisse. Headquartered outside of Munich, Germany, Alphaform AG (AFMRF) and (ATF:Xetra ) is a leading European contract manufacturer of complex and sophisticated components using 3D printing, see Alphaform’s services brochure. A 1996 spinoff from the industry giant EOS, Alphaform is a smaller company with about 235 full time employees, 5.3 million shares outstanding, and a tiny market capitalization of $23 million* (EUR to USD exchange rate of 1 EUR = 1.35 USD used in all instances). The company’s current share price offers great value when compared to U.S. listed companies that operate in the additive manufacturing space as an OEM, a 3D printing service provider, or both. I’ll chart some comparative financial metrics later in the article. For now I will say that the current Alphaform AG valuation of $23 million USD is remarkably inconsistent with full year 2013 revenue expected of $35.1 million USD. This translates to $6.62 in revenue/share…which is more than the ttm of revenue generated/share of 3D Systems and voxeljet combined. Moreover, Alphaform’s trailing twelve month revenue is 2.5X the trailing twelve months revenue of voxeljet AG (VJET) and yet voxeljet is valued over $500 million while Alphaform is valued at $23 million. When you then consider that “3D printing services” is projected to show the lion’s share of growth in the 3D printing industry by many analysts including Credit Suisse, the current valuation of Alphaform is astonishingly low. Alphaform AG operates in two segments: 3D printing/additive manufacturing, and bio-medical precision casting. The company recently announced a strategic move to further develop their more profitable 3D printing segment in a proposed 10 million euro restructuring program. The restructuring will allow Alphaform to invest in upgraded equipment, launch online order processing, open new sales channels, and provide additional engineering support for design services. The translation from German to English comes across as sounding somewhat dire because of a net loss and underperformance of the medical casting segment, but the company has announced that they’ll meet their 2013 revenue target of $35.1 million US and cash flow from operations for the first 9 months of 2013 was a positive $ 0.71 million. Like many companies in Europe, Alphaform had a rough first half of 2013 due to the eurozone recession which ended in August. As a result, revenue was off 6.2% for the first 9 months of 2013 compared to the same period in 2012. In my experience, some of the best investment opportunities can be found where companies are beginning to show improved sales following a completed economic downturn, and this appears to be the case with Alphaform AG. Note statements from the first paragraph of their Q3 report: “As a consequence of a stable economic situation again, we have noticed since July a permanent order increase in the 3D printing and additive manufacturing sector” and, “the sector is clearly profitable again”. Alphaform’s Q3 revenue of $9.5 million was among the strongest in their history. January data shows the eurozone economy expanded at its fastest pace in two-and-a-half years. The activity indicator for the German private sector moved up to 55.9 in January from 55 in December, with both the manufacturing and service sectors recording above-trend improvement, see: “Eurozone Recovery Gathers Steam On Strong Activity In Germany”. Moreover, German business confidence rose to the highest level in more than two years and beat economists’ forecasts in a signal that the expansion in Europe’s largest economy may be accelerating, see: “German Business Confidence Rises as Growth Pickup Seen”. London’s Close Brothers Group now estimates Alphaform’s 2015 earnings of .20/share USD. Investors should keep in mind that this estimate is derived using IFRS (International financial Reporting Standards) accounting. These standards are more closely aligned with U.S. GAAP reporting than the “headline” Non-GAAP numbers used by most 3D printer manufacturers. While I’m not an accounting expert, I am reasonably certain that if the more creative and malleable Non-GAAP method was used in Alphaform’s financial reporting, they would currently be EPS positive. Alphaform Total Assets (20.3 million euros) – Total Liabilities (8.7 million euros) = shareholders’ equity (book value) of 11.6 million euros. 11.6 million euros/5.3 million shares = 2.19 euros book value/share. The metrics below reveal how undervalued Alphaform is in comparison to better known 3D printing stocks. As of 2/7/2014 market close. ** Although Proto Labs (PRLB) generates the majority of revenue from injection molding and not true 3D printing services, they are increasing their service offerings in 3D printing/additive manufacturing and I have included the company in the comparisons. A major factor in revenue expansion and earnings growth is the introduction of new products and services. As mentioned above, Alphaform will be adding an online ordering system and expanding their engineering design services this year. I believe this high end art focus will carry higher gross margins with less cost and site maintenance then a business model like Shapeways for example, and expansion to other European countries with different languages could be easily and economically accomplished. With the eurozone economy now expanding at the fastest rate in 2 ½ years being led by Germany, Alphaform’s sales channel expansion, additional engineering support for design services, and launch of Artshapes, I believe the Close Brothers Group estimate of .20/share for next year can be attained. Alphaform AG has the lowest price-to-sales, the lowest price-to-book, and the highest revenue generation/share of any 3D printing stock I know of. I believe Alphaform will outperform better-known peers over the next 3-6 months as more investors discover they can in fact find value in a 3D printing stock. Disclosure: I own shares of Alphaform AG. I was not paid by Alphaform or any third party for this article.